Express trains run from Hong Kong to Guangzhou about every hour. Just about everyone on the train had a large screen smart phone and a second battery to keep it running on the journey. Seats with mains power are at a premium and USB charing sockets sought after at airports. The trip takes two hours and is comfortable and scenic. The catch is queuing at peak hours to get on. A new very high speed line is under construction. 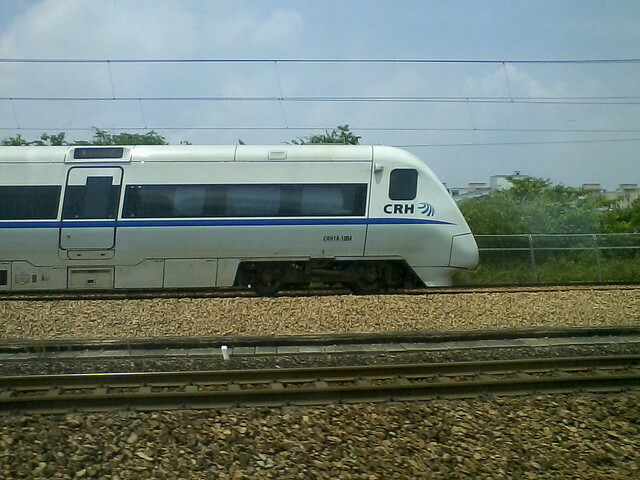 The train leaves from Hung Hom, Kowloon,and arrives at Guangzhou East Railway Station. Both are connected to the local metro (but finding your way from the intercity terminal to the metro is challenging.